Have you ever looked at a video game and wondered how that was created? Have you ever wanted to learn how to create a game but wanted an easy way to learn how to do it? If so, then this class could be for you. 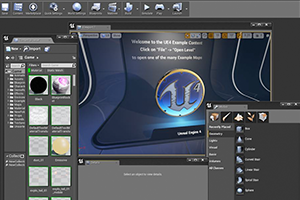 This introductory game production class will cover the basics needed for simple video game creation using Epic's Unreal Engine. Instruction will begin with the assumption that you know little to nothing about game design, but still be able to learn the steps necessary to make a video game. You will start by creating your own game with the instructor and going from laying out your own game idea on paper to producing an actual, simple (but working!) game in Unreal Engine IV. By the end of this class you will be able to place a character in the game you design, create an environment for your character to move around in and interact with other objects in the game. This class is for average computer users who have little to no experience with actual game design or game development. And most people will succeed in this class as long as they have the will put in a little time and effort to learn something that is not overly technical, viscerally exciting and fun to do.